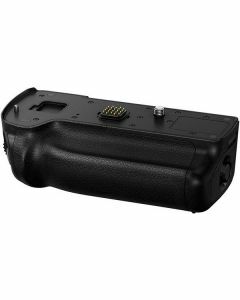 The DMWBGGH5E is a battery grip designed to add ergonomic handling when shooting vertical compositions as well as housing a second battery to the one found in the main body of the GH5, essentially doubling the battery life. The grip adds a vertical position shutter release as well as various controls aimed to help operation of the camera. In keeping with the design of the GH5 the grip is protected from harsh weather conditions including splash, dust and cold temperatues up to -10C).